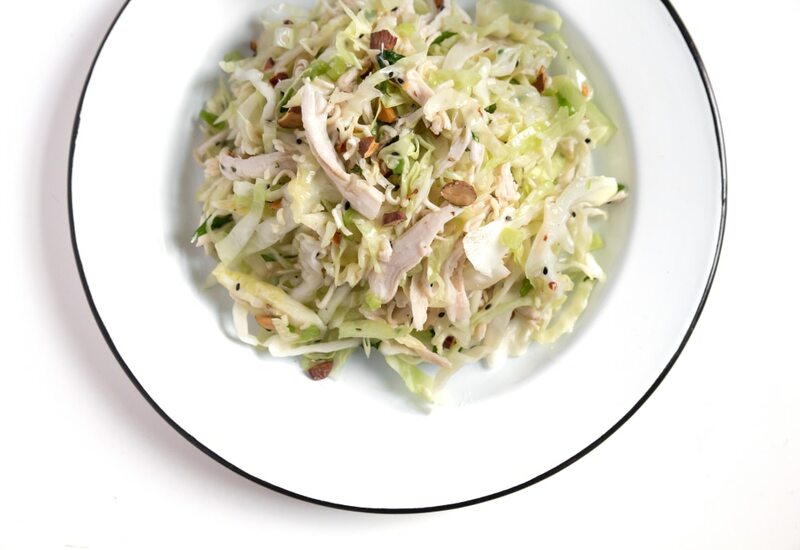 This main-course salad is a crunchy, addictive mix of shredded cabbage, chicken and green onions, tossed with a simple Asian-inspired dressing. Using a spiralizer makes shredding a whole cabbage a breeze. Dry ramen noodles and toasted almonds add crispy texture to the salad. Try salted peanuts instead of almonds for a different flavor. The dressing can be mixed ahead of time and refrigerated for up to a week, and the salad components can be cut and stored separately for up to three days—making this a great make-ahead dish for busy workweeks or potlucks. If you don't have a spiralizer, you can use a mandolin, a very sharp knife or even the slicing blade on your food processor to shred the cabbage. Looking to cut back on processed sweeteners? Try honey or agave nectar in place of the granulated sugar. Per Serving: 439 calories; 35g fat; 17.7g carbohydrates; 16g protein; 42mg cholesterol; 440mg sodium. Green onions omitted because they are the devil. 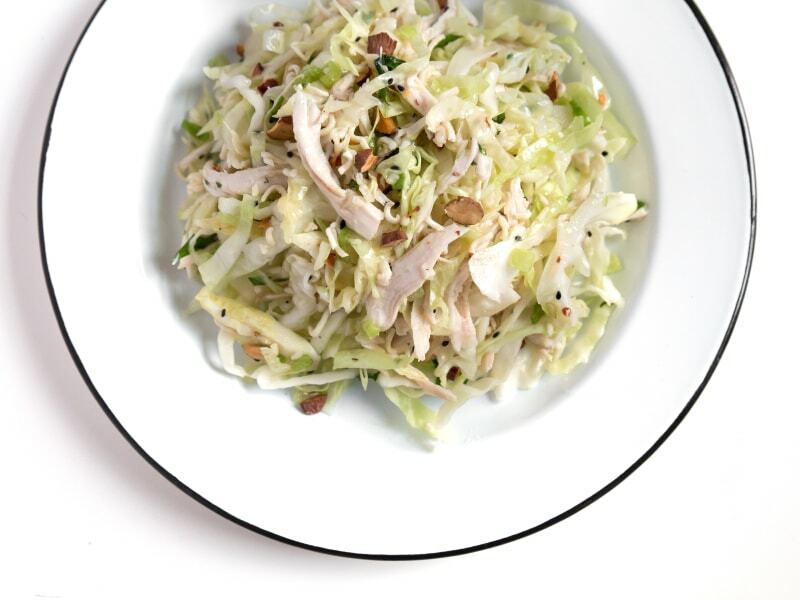 I wanted a little more "OOMP" in this slaw. I liked the use of the ramen noodles, though. Just wanted either more tang or some heat. Good thing sriracha goes on everything! HotPie and I are polar opposites when it comes to green onions: they are sent from heaven! I'll take all of his green onions, thank you! Love this salad, the crunchy cabbage and ramen are perfect with the chicken. I really liked this salad. After I tried the dressing, I knew I would want a lot of it so I doubled the recipe for my lunches for the week. Because it is cabbage, this salad lasted in the fridge a lot longer than normal salad. I will be making this one again for sure! I used a mandolin to shred the cabbage perfectly. I also used ginger infused honey instead of sugar, it was perfect. Used a rotisserie chicken for this salad, which made it really easy to throw together. The only thing I left out is the dry ramen noodles. I used sugar for the dressing, but probably should have used honey or agave. Next time I make this I'm going to swap out the sugar.